Ten years after the global financial crisis, its impact is still being felt in parts of the UK where house prices have declined or only slightly increased since 2008. Combined with wage growth across the UK, it’s now relatively easy to get on the property ladder in these cheaper areas. But in other parts of the country – particularly in London and the South East where house prices have risen dramatically since 2008 – property remains out of reach. The affordability of property is closely linked to your earnings: your max mortgage with most lenders will be around 4 to 5x your salary, and they will also “stress test” your finances to ensure you can still keep up repayments if your mortgage’s interest rate goes up. Now we’ll take a look at the most affordable places to live across the UK. We’ll analyse how house prices and wages have recovered (or not) across the UK, which areas are unaffordable for most people, which regions have become more affordable – and what this all means for you and getting a mortgage. The Hometrack City Index shows us what has happened to house prices in all major UK cities. There are large differences across the UK which makes buying a home more or less affordable depending on where you live and work (or where you want to live and work). Overall, at the end of August 2018, annual house price inflation in the 20 major UK cities was running at 3.9%, ranging from a 7.5% increase in Liverpool to a 3.7% drop in Aberdeen. Aberdeen is one of only three cities showing a drop. Prices have fallen for each of the last three years, illustrating the impact local economic shocks can have. Aberdeen is reliant on the oil industry which was severely hit at the end of 2014 when the price of a barrel of oil was halved. The other two cities where house prices have fallen in the last year are Cambridge, down by 0.1% and London by 0.3%. Both previously saw some of the biggest price increases of the last 10 years and have the biggest income-to-house-price ratios in the UK. The overall increase in the Hometrack City Index is fuelled by big increases in historically cheaper cities, such as Liverpool, Glasgow, Manchester and Leicester which are now becoming less affordable. However, the average house price in Liverpool at £120,100 is still 4% below 2007 levels. Similarly, recent increases in Glasgow have only lifted prices to £124,400, where they were in 2007. Prices in Newcastle are also 2% below 2007 levels. The Office for National Statistics (ONS) collects house price data for each of the UK regions and we can compare August 2008 with August 2018 to see the changes. August 2008 is before the height of the financial crash, but after its initial impact and after house prices had already fallen sharply from the peak of summer 2007. The BBC has a useful tool that can show you how house prices in a specific postcode have changed between 2007 and 2017. The data illustrates the variation in the recovery of house prices across the UK. In Northern Ireland, prices are still well below August 2008 levels. In the north-east they’ve barely risen. Wales, Scotland and other parts of northern England have seen modest increases, and the Midlands has experienced a sizeable bump. The south and east of England have seen some massive price increases over the last 10 years, with London leading the way. Here’s the ONS data for the average disposable income per person in a number of UK local authorities, from 2006 to 2016. These numbers look pretty good – until you realise that they don’t include inflation, which has reduced the value of £1 by 32.8% between 2006 and 2016. This means that in almost every part of the UK – except for parts of London – disposable income has decreased over the past decade. Many households are actually poorer than they were in 2006, thanks to slow wage growth over the last decade and a high inflation rate between 2009 and 2013. When it comes to house affordability, disposable income factors into the “stress test” that lenders will perform when assessing how much you can borrow to buy a home. Lenders must ensure that you can still afford your mortgage repayments if interest rates go up. 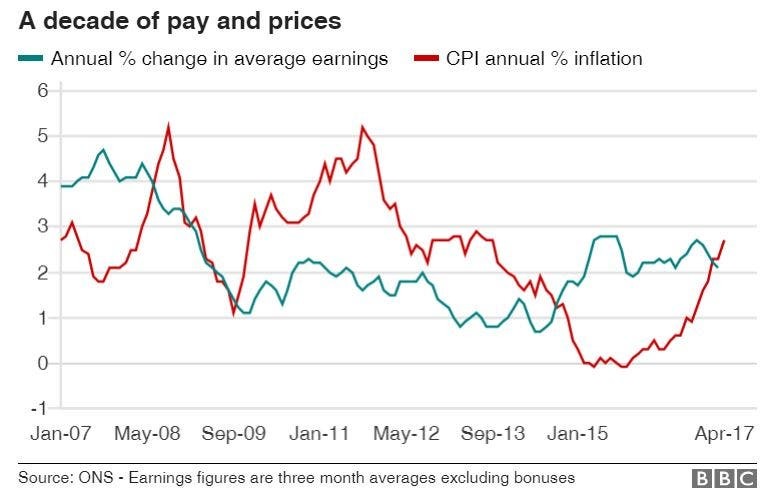 To match house price inflation (or deflation) you need your wages to go up by the same amount over the same period. That’s unlikely for a number of reasons – mainly because for most of us, wage increases are rarely pegged to inflation. Millions of public sector workers have had wages frozen or increased by less than inflation for several years between 2008 and 2018. Data from the ONS shows that in general, earnings have risen by more in regions that have seen the biggest rise in house prices, but there are wide variations within each region, often linked to the type of businesses that set up in the area, property supply and demand and many other reasons. Regions that have lower wages are usually industrial areas with lower-paying jobs. Higher-paid professions are usually concentrated in cities, not rural areas, which is why in any single region there are big differences between average earnings in cities and rural areas, even those very close to each other. House price affordability has increased for those living and working in Northern Ireland and the north east of England. Many of these areas have experienced wage increases of around 30% while house prices have fallen or remained the same, suggesting that it’s now more affordable to buy a property there. Similarly, salary rises are generally higher between 2008 and 2018 than house price increases in Wales and Scotland, suggesting it’s a bit more affordable there. However, house price increases outweigh salary rises in parts of the south east, where it’s become less affordable to buy a property. London varies considerably both in the salaries and house prices in each area and the rate that each has gone up by. For all regions of London, any improvement gained from wage increases being higher than house price increases is mitigated by extremely high house prices that are simply unattainable unless you have a very high household income (£100,000+). How do the changes affect mortgage affordability? The obvious answer if you’re looking for somewhere to buy a home that’s more affordable is to have a relatively well-paid job and be close to a city for commuting purposes, but buy a home in a more rural area where house prices haven’t risen as fast. You then benefit from higher salaries and lower house price inflation. Southend in Essex is a good example. The ONS survey of annual earnings puts Southend at the bottom, one of only two southern towns in the bottom ten. At £413 a week, average pay is just over half that of London, which is why many residents commute to London which pushes up the average pay for a Southend resident by £144 per week to £557. By contrast, average house prices are just over £300,000, according to Zoopla – much more affordable than all parts of London on a London salary, even adding in commuting costs, but still too expensive for a typical Southend salary. It’s not always that simple, because commuting costs and other local factors affect house prices, and you’ll usually pay a premium for commuter-friendly properties. But other areas, mainly in the north of England and Northern Ireland, have low salaries and also have low house prices, which makes getting a mortgage easier. For instance in Southend, the average annual salary is £21,476. If a lender were to lend 4.5 times annual salary, that’s £96,642, way below what’s needed to get a mortgage on a £300,000 house. If you then look at Huddersfield, with the second lowest annual salary of £22,048, compared to local house prices of around £175,000, you can see mortgages are much more affordable in Huddersfield than Southend. So, there are big variations in house price affordability across the UK and many local factors affect both house prices and wage levels. But, there are ways of bridging the gap by buying in a more affordable area and working in an area with better paid jobs.